I investigated Pouchongs in some depth a while back on this blog, having previously not known very much about them. However, although I had researched them thoroughly, I had not had a chance to sample them as much as I would like, and as such they featured on my list of five teas that I would like to explore more. Following up on this list, I decided to give the English Tea Store’s Spring Pouchong a try. Grown, processed, and packed in a small remote town in Taiwan, this pouchong is produced entirely by hand, using the same traditional methods followed by generations of tea growers in this area. Pouchongs are lightly oxidised oolong teas, although the low level of oxidation means that they often taste like, or are grouped with, green teas. As such, they are at their best when brewed in water that has been lightly boiled (165-190°F or 74-90°C), and they often have a slightly shorter steep time than regular oolong teas. The recommended steep time for Spring Pouchong is 1-3 minutes­– quite a large time frame, which leaves a lot of room for personal preference. For my first steeping, I decided to err on the side of a shorter steep and left the leaves for 1 minute. The result was a lightly fragranced brew with floral overtones, which had more similarities to a green tea than to an oolong tea. Pure pouchongs such as this one can be resteeped several times, and so on my second brew from the same leaves I left them to steep for 2 minutes. On the third resteep I left them for 3 minutes. As the second and third steeps tend to be lighter, the resulting brews were of about the same strength as the first as they steeped for longer. 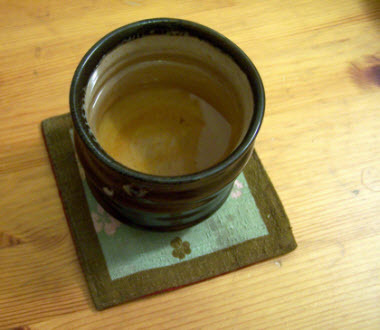 I found that Spring Pouchong re-steeped very well, and provided excellent second and third cups of tea. I wanted to experiment with a longer steep the first time around, and so, starting with a fresh batch of leaves, I left them to steep for 3 minutes. The result was a tea that tasted like standard strong oolongs that I am used to. The subtle floral overtones that were present in the lighter brew were masked in this stronger brew. That is not to say that I preferred one to the other, but I feel that the unique qualities of Spring Pouchong are lost slightly when brewed for a longer period of time and the resulting brew is more recognisable as an oolong. This range of steeping times means that Spring Pouchong is a very versatile tea that can suit tea drinkers who prefer pouchongs that are closer to green teas, or who prefer them closer to oolongs. It could also be good for those who enjoy both, as they can opt for a shorter steep on some days and a longer steep on others.